29-5/3 2019 AGA Operations Conference & Biennial Exhibition & Spring Committee Meetings, Nashville, Tenn.
Click here to sign up to receive the Pipeline Safety Update. On October 30, Howard (“Skip”) R. Elliott was sworn in as Administrator of the Pipeline and Hazardous Materials Safety Administration (PHMSA). Mr. Elliott joins PHMSA following a long career at CSX Transportation, where he served as Vice President of Public Safety, Health, Environment, and Security and was responsible for hazardous materials, transportation safety, homeland security, railroad policing, crisis management, environmental compliance and operations, occupational health management, and continuity of business operations. On December 13, the Liquid Pipeline Advisory Committee and Gas Pipeline Advisory Committee (GPAC) will meet to discuss a variety of policy issues and pipeline safety topics. On December 14-15, the GPAC will meet to continue consideration of a proposed rule addressing proposals to amend safety regulations applicable to gas transmission and gathering pipelines. The meetings are public; registration and additional information is available here. On November 13, the Department of Transportation (DOT) issued a final rule harmonizing drug testing regulations with revised mandatory guidelines of the Department of Health and Human Services. Among other things, DOT is adding hydrocodone, hydromorphone, oxycodone, and oxymorphone to its drug-testing panel, revising certain test analytes, removing the requirement to submit blind specimens, and makes additional technical amendments. The revised regulations become effective January 1, 2018. PHMSA Rulemakings Update. The tables below summarize the status of pipeline safety rulemakings pending before PHMSA, as reflected in DOT’s October Significant Rulemaking Report and the Unified Regulatory Agenda, released in July by the Office of Management & Budget’s (OMB) Office of Information and Regulatory Affairs (OIRA). The Unified Regulatory Agenda now appears in two principal parts: Current Agenda Agency Regulatory Entries for Active Actions and Current Long Term Actions. Under Executive Order (EO) 12866, OMB reviews proposed significant rules to ensure they are consistent with applicable law, the President’s priorities, and the principles set forth in the EO, and to ensure the proposals do not conflict with another agency’s policies or actions. OMB also analyzes the cost-benefit analyses in support of the proposals. While the EO sets out deadlines for OMB evaluation, review periods are often extended. PHMSA seeks comments on revisions to gas distribution annual report. PHMSA issued a notice and request for comments on a proposed information collection to be submitted to OMB reflecting revisions to the gas distribution annual report, Form PHMSA F 7100.1-1, and its instructions. The proposed changes are intended to clarify selections of Operator Type and revise the formula for calculating lost and unaccounted for (LAUF) gas to make it consistent with the methodology used by the Energy Information Administration for calculating LAUF gas. Comments are due December 18. OMB approves annual report for underground natural gas storage facilities. On October 2, PHMSA issued a notice that OMB has approved PHMSA’s annual report for underground natural gas storage facilities. Storage operators must file their first annual reports on March 15, 2018, reflecting information for the 2017 calendar year. DOT receives comments on regulatory review. DOT has received hundreds of comments regarding its request for comments on existing rules that are good candidates for repeal, replacement, suspension, or modification as part of a review of the agency’s existing regulations and other agency actions to evaluate their continued necessity, determine whether they are crafted effectively to solve current problems, and evaluate whether they potentially burden the development or use of domestically produced energy resources. The deadline for submitting comments is December 1. Comments are available by searching Docket No. DOT-OST-2017-0069 on Regulations.gov. PHMSA receives additional comments on interim final rule on underground natural gas storage facilities. PHMSA received numerous comments in response to the notice reopening the comment period issued October 19 regarding the interim final rule (IFR) entitled: “Pipeline Safety: Underground Natural Gas Storage Facilities.” PHMSA reopened the comment period in response to a petition for reconsideration filed jointly by the American Gas Association, American Petroleum Institute, and the American Public Gas Association. PHMSA intends to issue a final rule considering the public comments and addressing the petition for reconsideration in January 2018. Comments are available by searching Docket No. PHMSA–2016–0016; on Regulations.gov. Presentations from PHMSA’s Voluntary Information-Sharing System Working Group meeting are available. On November 29-30, the Voluntary Information-Sharing System Working Group (VIS) met to discuss the objective and scope of the VIS effort, including lessons learned from past incidents, best practices, examples of existing information-sharing systems, safety management systems, and the establishment of subcommittees. The goal of the committee is to provide recommendations to the DOT Secretary as required and described in Section 10 of the Protecting our Infrastructure of Pipelines and Enhancing Safety Act of 2016 (2016 PIPES Act). Presentations from the meeting are available here. Presentations available from PHMSA’s public meeting Coastal Ecological Unusually Sensitive Areas. On November 17, PHMSA convened a public meeting to discuss applicable definitions and available geospatial information system (GIS) data sources for marine coastal waters, coastal beaches and the Great Lakes, pertaining to Coastal Ecological Unusually Sensitive Areas (USA). Presentations from this meeting are available here. DOT OIG issues report on top management challenges for FY 2018. On November 15, DOT’s Office of the Inspector General (OIG) issued a report identifying the department’s most significant management challenges for fiscal year 2018. For PHMSA, OIG noted a lack of sufficient processes, oversight, and project management skills to address mandates and internal deadlines in a timely manner. In part, the OIG concluded that PHMSA’s rulemaking delays are due to ineffective coordination with the other agencies involved with the transportation of hazardous materials (the Federal Aviation Administration, the Federal Motor Carrier Safety Administration, and the Federal Railroad Administration). While OIG noted that PHMSA has begun improving how it handles rulemakings through its prioritization process, it is too soon to determine whether these efforts will be effective. PHMSA issues report on inspection findings notifications. On October 18, pursuant to section 7 of the 2016 PIPES Act, PHMSA released a report to Congress regarding the frequency that PHMSA or one of its state partners exceeded the deadlines for providing post-inspection communications to pipeline operators. The 2016 PIPES Act requires that PHMSA and its state partners provide operators a post-inspection briefing within 30 days and written preliminary findings within 90 days of pipeline safety inspections. Rep. Peter DeFazio questions rulemaking delays. On November 9, Representative Peter DeFazio (D-OR) sent a letter to Secretary of Transportation Elaine Chao questioning PHMSA’s delay in adopting regulations identified in the Pipeline Safety, Regulatory Certainty, and Job Creation Act of 2011 addressing automatic and remote control shutoff valves, leak detection technology, verification and documentation of maximum allowable operating pressure for certain gas transmission pipelines, and expansion of integrity management programs. Representative DeFazio requested an explanation for the delay in adopting final rules and urged immediate action to finalize them. On October 8, Governor Jerry Brown approved Assembly Bill 1197, the Lempert-Keene-Seastrand Oil Spill Prevention and Response Act, amending requirements for oil spill contingency plans for facilities, including pipelines. The bill authorizes an owner or operator to rely on its own response equipment and personnel if they have been rated by the Administrator of the California Office of Spill Prevention and Response for oil spill response. Oil spill response plans must identify a spill management team (SMT), which would apply to the administrator for a certification of that SMT’s response capabilities. The bill would require the administrator to establish criteria for certifying an SMT based on the SMT’s capacity to respond to spills and manage spills effectively and review applications for SMT certification. The bill requires an oil spill contingency plan to identify at least one certified SMT and would authorize an owner or operator to rely on its own SMT. The Department of Conservation’s Division of Oil, Gas, and Geothermal Resources has proposed changes to its testing regulations applicable to gathering pipelines and pipelines within oil and gas production fields. The proposed regulations do not affect transmission or distribution pipelines. The proposed changes would add definitions for “active gas pipelines” and “sensitive areas,” and would require annual inspections for leaks and defects of active gas pipelines that are more than 10 years old in sensitive areas. Mechanical integrity testing would be required every two years on all active gas pipelines in sensitive areas. 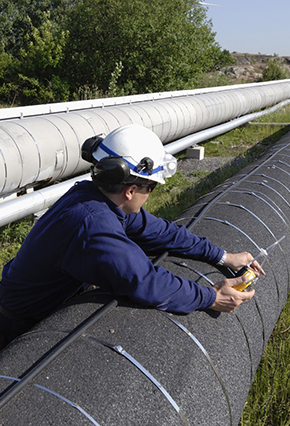 Pressure testing would be required for any pipeline that has experienced a reportable leak. In addition, operators would be required to submit their pipeline management plans (PMPs) to the Division within one year of the effective date of these regulations and some specifications for the PMPs would be added. Comments were filed November 10. The Oil and Gas Conservation Commission has proposed to strengthen regulations applicable to flowlines and to improve uniformity of operator participation in the 811 one-call program. A public hearing will be held on January 8-9, 2018. The Utility Regulatory Commission has proposed to adopt the updated federal gas pipeline safety regulations in 49 C.F.R. Parts 40, 191‐195, 198 and 199. The proposed rule would change the “as of” date of adopted regulations from March 1, 2016 to June 1, 2017. On September 27, State Representative Maturen introduced HB 5026, the “MISS DIG underground facility damage prevention and safety act.” The bill would remove the state transportation department and county road and drain commissions from the definitions of “facility owner” and “facility operator.” The bill has been referred to the Committee on Transportation and Infrastructure. On November 15, the New York Public Service Commission proposed to modify requirements applicable to the inspection of plastic fusions and related reporting requirements. The proposal would amend regulations regarding who may inspect plastic fusions, and specify qualification and quality assurance standards. Comments are due December 30. Several bills have recently been proposed in the Pennsylvania Legislature. SB928 (Dinniman): would require that, before constructing a pipeline, a public utility must submit an application to the Pennsylvania Public Utility Commission (PaPUC) for authorization to site a proposed pipeline in order to meet safety and environmental metrics, such as land use, soil/sedimentation, plant/wildlife habitats, terrain, hydrology, landscape, etc. The proposed legislation also would require consultation with the Pennsylvania Department of Environmental Protection, local county governments, and local emergency management organizations, and two public hearings. The bill has been referred to the Committee on Environmental Resources and Energy. SB 929 (Dinniman, Boscola, and Raffety): would establish a pipeline emergency response fee and a pipeline emergency response fund. The bill would allow a county with a pipeline located within its borders to impose a fee on the pipelines located in the county if that pipeline is regulated by the PaPUC or subject to Act 127 safety regulation. The fee would be five percent of an operator’s total gross intrastate operating revenues for the transportation of natural gas through a pipeline within Pennsylvania for the immediately preceding calendar year. An operator subject to the fee would be required to provide annual updates on the annual total volume and total revenues from the transportation of natural gas through pipelines with the State. The collected fees would be deposited in a pipeline emergency response fund, and distributed to counties or municipalities to increase emergency response capabilities or for costs incurred in responding to a pipeline emergency. The bill has been referred to the Committee on Environmental Resources and Energy. SB 930 (Senators Dinniman, Yudichak, Rafferty, Browne, Folmer, and Mensch): would require public utilities that operate gas and liquid pipeline facilities to meet with each local emergency management organization near each facility at least twice a year. At a minimum, the public utility would be required to identify any high consequence areas and potential impact radius within the jurisdiction of the local emergency management organization, and provide the public utility’s current emergency operating procedures. The PaPUC may impose civil penalties and other appropriate remedies for violations of these requirements. The bill has been referred to the Committee on Consumer Protection and Professional Licensure. SB931 (Senators Rafferty, Folmer, Mensch, Costa): would require that public utility pipelines transporting natural gas or natural gas liquid to install automatic or remote shut off valves on pipelines located in high consequence areas. The bill has been referred to the Committee on Consumer Protection and Professional Licensure. On November 28, the TRC held a workshop regarding several amendments to the Texas Administrative Code that are under consideration, but not yet proposed. The TRC is seeking comments on amendments regarding creation of a pipeline safety and regulatory fee: 1) the method of calculating an annual pipeline safety and regulatory fee; 2) a process to reconcile the actual amount collected to the amount appropriated and make any necessary adjustments; and 3) reasonable fees for late payments. On October 31, the TRC proposed amendments to its damage prevention regulations. The proposal would: (1) remove a reference to “intrastate” pipelines to clarify that the TRC has damage prevention authority over both interstate and intrastate pipelines; (2) require an excavator that damages a pipeline to notify the pipeline operator at the earliest practical moment, but not later than one hour, after the incident; (3) require an excavator to report any release of product from a damaged pipeline by calling 911; and (4) to allow excavators and operators 30 days after a damage incident to submit information regarding the incident to the TRC. The proposal was published in the November 24 Texas Register, and comments are due January 2, 2018. Bills introduced in the Assembly and the Senate would create procedures for handling complaints about violations regulations regarding excavations, would make certain changes to those requirements, and would increase the maximum penalty for violations. The Senate bill has been referred to the Committee on Elections and Utilities, and the Assembly bill has been referred to the Committee on Energy and Utilities. To download a full text PDF, which includes Dates of Interest, upcoming PHMSA State Seminars, and State Specific Association Meetings, please click here.